Many people dream of travel adventures, but not everyone is ready to risk traveling solo. At TourBar, the biggest network for solo travelers, we collected statistics and interviewed our members to learn what are the most popular and the best places for female solo travelers. New York, a concrete jungle and the dream city, attracted 7 percent of female travelers. Not surprisingly, since the city that never sleeps has a lot to offer for people interested in art, fashion, architecture, nightlife and gastronomy. Most popular places to visit among TourBar solo travelers are: Central Park, Metropolitan Museum, Broadway, Fifth Avenue, Brooklyn Bridge and Bryant Park. Andrea, TourBar member from Romania, Bucharest, shared her impression of her last trip to New York: "I took my first solo trip to New York and it was fantastic! I was lucky to find a great local guide Mike on TourBar. Mike showed me incredible places in his local area SoHo. He also gave me lots of useful suggestions, like not to take cruise boat to Liberty Island, but to take Staten Island Ferry to save time and money." Barcelona was chosen by 5 percent of TourBar solo travelers, and it is the second in our hot summer destinations list. The city is famous for its breathtaking architecture, gorgeous cuisine, warm, sincere locals and splendid weather. Most popular sights to visit are: Sagrada Familia, Picasso Museum, Park Guell, Las Ramblas neighborhood, Casa Batlló. Among the interesting activities mentioned by solo travelers are: trying tapas and perfect paellas; riding scooter in winding historic streets; and swimming in Piscina Municipal de Montjuic, an Olympic pool, with majestic view of Barcelona. Rome, one of the most beautiful cities in the world, attracted 4.5 percent of TourBar female travelers. The city is certainly has a lot to offer for travelers interested in history and art. Hence most popular sights to visit are Colosseum, Pantheon, Roman Forum, Trevi Fountain, Spanish Steps, St. Peter’s Basilica and Vatican Museum. It will be an understatement to call Rome a destination for foodie travelers. There are few cities in the world that can offer as much as Rome in terms of gastronomy. It’s mandatory to try gelato, crostata di ricotta (a version of cheesecake), coda alla vaccinara and carciofi (local artichokes). The best way to try all these dishes is visiting small local restaurants that keep traditional recipes for centuries. TourBar locals from Rome can certainly suggest the best local restaurants to visit. 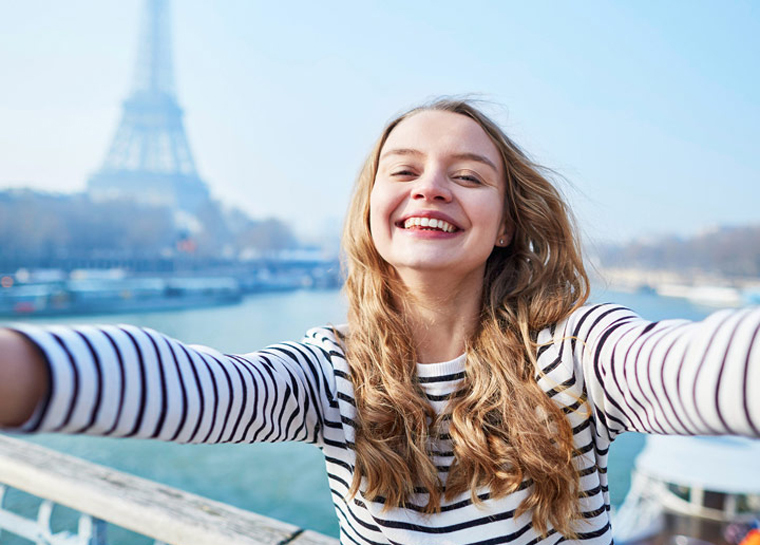 Paris was chosen by 4 percent of solo travelers. Besides traditional Eiffel Tower, Notre-Dame de Paris and The Louvre TourBar female travelers mention visiting different art and cultural events, Montparnasse Tower, Belleville neighborhood (home to one of Paris's Chinatowns and a dizzying array of cultures), La Défense (a major business district with a collection of ultra-modern architecture) and Maison de Victor Hugo. Bangkok attracted 3.6 percent of local female travelers. Lisa, a TourBar member from Saint Petersburg, Russia, commented on her recent adventure in Bangkok: "When I first arrived I felt a bit lost. It’s such a huge city. Alex, a local expat, who I met on TourBar, suggested the best ways to get around the city. It was he, who persuaded me to take tuk-tuk (an auto rickshaw). We were riding the tuk-tuk and Alex was telling me about all the interesting things he knew about the city. It was certainly the most exciting excursion in my life!"